Because the other thread title just doesn’t quite cut it. I appreciate you assisting during the tough times at the club woosha but our season is over after 7 games. Pay Paul Roos 1 million to take over as caretaker coach for the rest of the season because I have no confidence in any of the assistant coaches. Any other suggestions for caretaker coaches? None of the other 2? Really! I must admit, I was a fan of his last year. But he completely unimaginative. Sack him but they MUST SACK all the assistants. And a few board members must go. Whoever is our so called development coach must go. And the players must all be held to account. I’m onboard the ‘Paul Peos’ as caretaker coach train. Paul Roos? You may as well chase Mick Malthouse and Malcom Blight. Clarksons gettable make it so. So much for being back in the black. I don’t think he is a bad bloke just needs to do the right thing and go. I don’t understand why he isn’t sacked already? There should have been security guards waiting outside the coaching box. Take his credentials, keys and clipboard. Send him straight home. Toxic cancer and blight to our club. The board should have been meeting the MOMENT we lost the 3rd quarter (well to be truthful they should have been meeting three or four weeks ago but whatever)… this is beyond a joke. Our club is a joke. Through the saga we defended the club but no more. They are bunch of limp wristed ■■■ wipes who couldn’t manage a bar on a college campus. Sack the whole farkin lot of them. call up James Hird, get in Caracella and then lets get this ship back on track. Is this his final year and then he has a 2 year extension? So sacking him now we’d pay him out for 2 1/2 years? I wouldn’t even let him give the presser. I would embarrass him, just like he is embarrassing the EFC and fans each and every single week. Take your clipboard, homemade valium, and head straight to the car park. Do not pass go. Just go. Right now! He wants to be sacked. Just wants the payout. Nothing surer. The stupid ■■■■ that gave him the new contract caused this and now we have an expensive shitshow on our hands. Yep that is correct… but each board member should be forced to ‘donate’ a fair share of it… they approved this madness. Couldn’t even wait for mid season… bunch of ■■■■■■ morons. 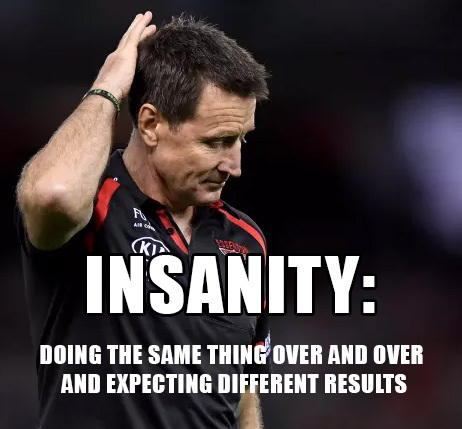 I’m cognisant of that fact that sacking Worsfold is like impeaching Trump. They may go but a more inept ■■■■ is ready to takeover.